Did you know if you add more gateways to one Voice Route, the calls to the gateways will be evenly delivered. According my measures, if there are two gateways, maximum 3 consecutive calls goes to the same gateway, the 4th one goes to the other gateway. If you create two Routes with the same pattern to match and same PSTN Usage assigned, the one upper on the Route list will be always used, unless the gateway(s) assigned to the route is down. This can be used in fail-over situations. You sacrifice showing the right A number for outbound calls, unless your local operator lets you send any arbitrary number, even foreign ones. Primarily for all international calls a dedicate SIP trunk is used. Every user should be able to call every number in the country where company operates. To make things more clear, one route has one associated PSTN usage. 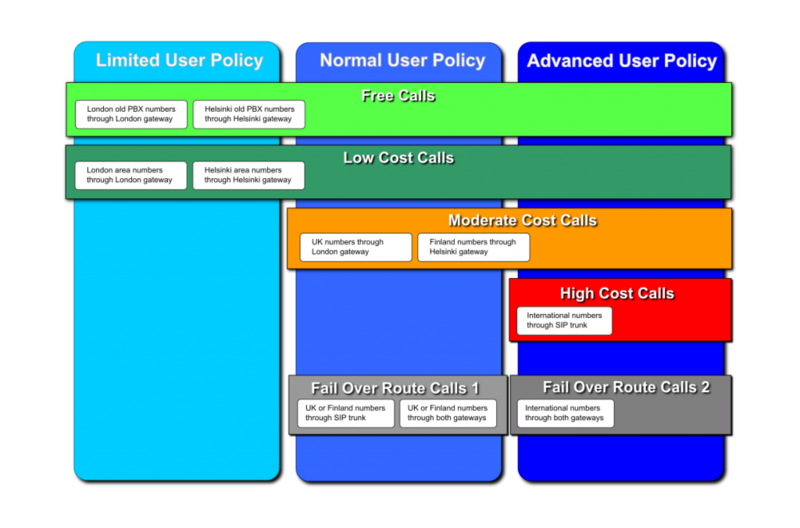 PSTN usages are created based on the minute price of the calls, plus additional PSTN usages are created for the fail-over routes. First of all, don’t let you get confused by the CSCP, where you cannot just create a single PSTN usage, but you have to create it from a Voice Policy configuration. Also when you check out a Route, the PSTN Usages are listed there with the associated Voice Policies, but right on the Route page you shouldn’t care about the Voice Policies associated. You should start with PSTN Usages, but you cannot. First you have to create Voice Policies. Create Voice Policy according to the user rights to place calls. e.g. Define routes through the gateways: Here you can define all the possible ways to reach different category numbers through all the gateways. Define the least expensive routes first and assign them the appropriate PSTN Usage. Define shortest, cheapest routes for all possible numbers you want to provide reach to: e.g. Define alternative routes to provide fail over paths: e.g. This entry was posted in Lync and tagged PSTN Usage, Routing, voice by kovacsa. Bookmark the permalink.